Eric Furby, Monbulk CFA Captain Simon Schroeder, Alan Hamilton, Alan Clerke, Brigade Auxiliary president Sally Rutzou and Brian Rutzou. 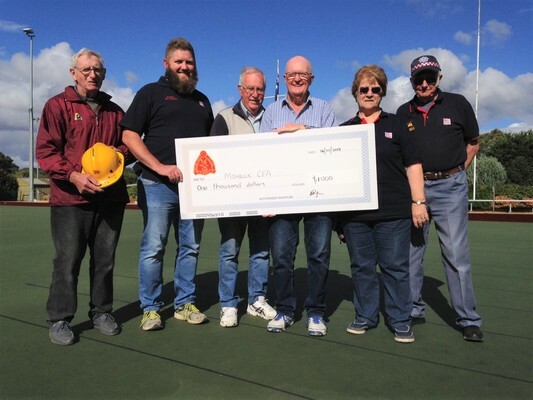 Monbulk bowlers made a special effort to raise money for the Monbulk CFA recently. Bowlers arrived early for their Wednesday social competition and enjoyed a sausage sizzle lunch. Alan Clerke organised raffles to be held during the afternoon and all the profits, including the green fees, went to the Monbulk CFA. The amount was further enhanced by the wrong bias box, which is actually a converted old fire helmet. Eric Furby rattles the helmet each week to extract a dollar from every bowler who puts a bowl down on the wrong bias – so the CFA does well when Monbulk bowls badly. The Monbulk Bowling Club (MBC) board bumped up the donation to $1000. Club president Alan Hamilton thanked the CFA representatives for their continued valuable work throughout the year. He presented the cheque to the Brigade Auxiliary president Sally Rutzou and brigade captain Simon Schroeder. 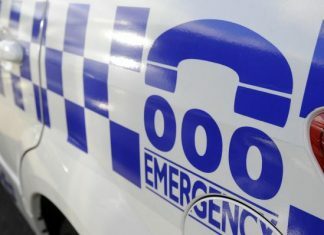 Simon thanked the bowlers for their support and said the amount would be put towards upgrading the car rescue equipment on the Monbulk rescue unit. These units are equipped with a large array of rescue equipment including the ‘jaws of life’ which are designed to free people trapped in their car following a road accident.